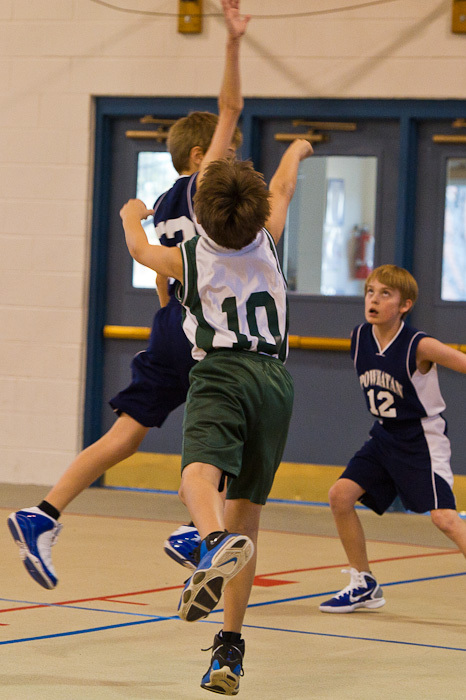 Being in sixth grade at The Hill School means you play on the sixth-grade basketball team, no matter how tall (or short) you may be. Cam, being one of the two shortest boys in the class, has faced his fledgling basketball career this winter with a great attitude. He enjoys the game, but he’s certainly no Michael Jordan. Due to his quick reflexes, though, he’s found a niche as a solid defensive player. This afternoon I attended Cam’s second game, against nearby Powhatan School in Boyce, Virginia, to cheer on Hill and try my hand at photographing a new sport. 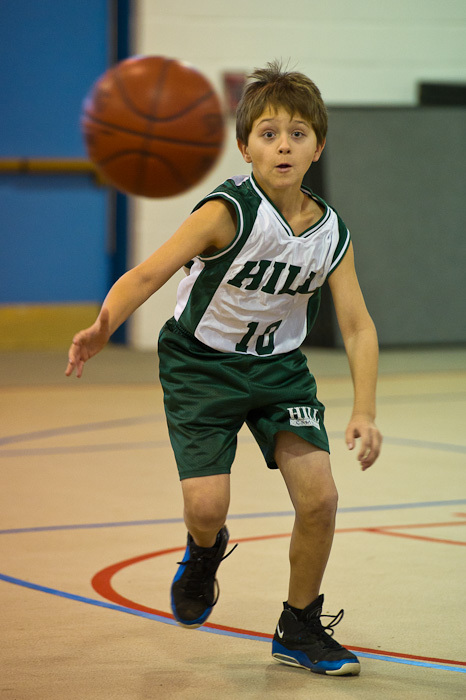 The Hill sixth-graders lost their first game to Loudoun Country Day School by a score of 23-11, so I wasn’t anticipating a victory. Therefore, when the score was Powhatan 11 and Hill 3 at halftime, I wasn’t too surprised. But then a strange thing happened. Hill made a comeback. After a motivating halftime pep talk by the coaches, the Hill kids started shooting and sinking baskets. Led by their star player Cole, Hill dominated the second half, and with less than a minute remaining in the game it was tied 13-13. 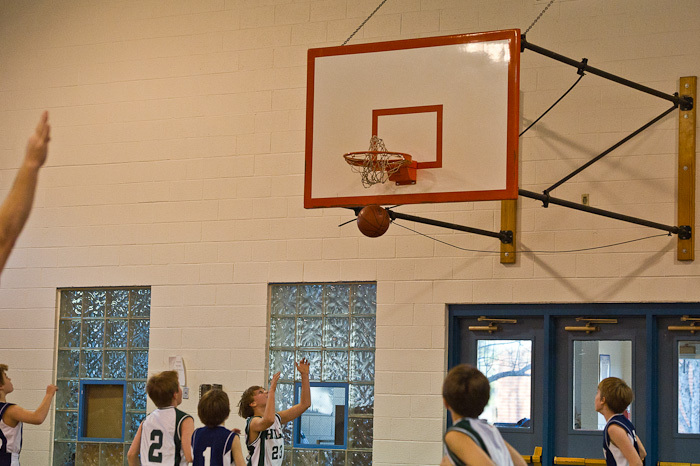 I’d never shot a basketball game, so I was focused on following the ball and anticipating the action as best I could. So, as I photographed Cole passing to Payton and then passing to Cam, I wasn’t really prepared for what happened next. Cam, standing well outside three-point range, leaped and took a shot. The ball floated in the air before swishing through the net, allowing Hill to take the lead and eventually the game, 16-13. I have to admit the whole experience brought me to tears. Thankfully, I was behind the camera so mostly went unnoticed. With fellow parents cheering for Cam, and his teammates and coaches giving him hugs and high-fives, it was an amazing and memorable moment that I’m so happy to have witnessed. Although I know it’s only one minor game on one day in his life, I’m grateful to have been there for him and to have received the hug he gave me afterward, which means more than any victory ever could. What a great victory for Cam and the team! So glad you were able to share those amazing and happy moments! Yes, I was fortunate to be there…one of those times I’m so grateful to have the flexibility to attend my child’s special events, and this one was pretty special! This is way cool and the photos are terrific. Congrats to all!!! Thanks, David. Yes, it was so cool to be there! One of those favorite moments! That was some exciting game.!! Wish I could have been there. I wish you could have been there, too! But we’ll have lots more photos to show you. Nice set of photos. I tried liking them but it wouldn’t take. So, consider yourself Liked!